The object-oriented paradigm, first introduced in the language Simula, has been the central design principle of many new programming languages, and has also resulted in object oriented extensions to existing conventional languages. 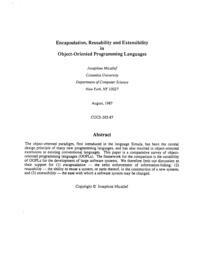 This paper is a comparative survey of objectoriented programming languages (OOPLs). The framework for the comparison is the suitability of OOPLs for the development of large software systems. We therefore limit our discussion to their suppon for (1) encapsulation - the strict enforcement of information-hiding; (2) reusability - the ability to reuse a system, or parts thereof, in the construction of a new system; and (3) extensibility - the ease with which a software system may be changed.